KowOor is the first oldest magic shool in Southern Thailand (today becomes a temple). 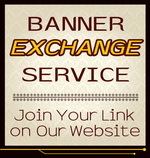 This place magnetizes people who love magic and supernatural arts to come to learn. Until now, KowOor has built a lot of skilled guru monks and masters who are propagating magic of KowOor in many areas in Thailand. 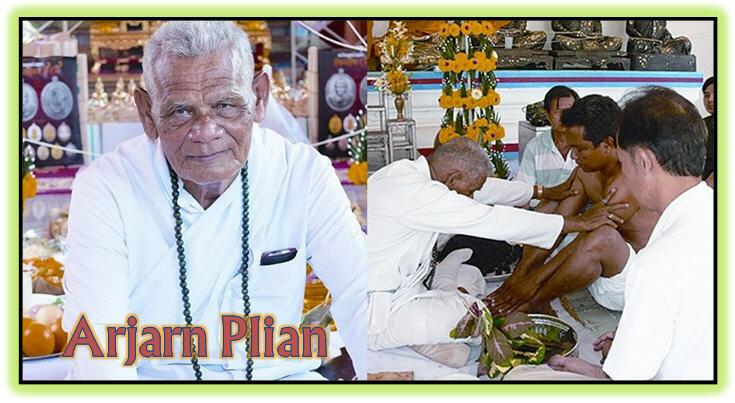 Arjarn Plian (Mr. Plian Hatthayanon), a layman who is proficient at magic and mantras from Phattalung province, Southern Thailand. He is so attached to Wat KowOor, formerly known as the magic school of the South because he ever studied there. 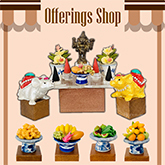 Today, AJ Plian helps Wat KowOor hold ritual ceremonies keeping magical knowledge what he loves. Power: Look Sakot is one of Thai amulets that have been created for a long time. Its name means "to mesmerize". It looks like a long bead. Look Sakot is believed to powerfully protect owner in danger. In the past, Thai men took Look Sakot to the war. Some held Look Sakot in their mouths to be invisible and pass by circle of enemies. Other wore Look Sakot on their waists to be invulnerable to weapons and to get enemies in control. See Phueng Salika Maha Larp - Superb Wax of Charm & Biz! Power: Magic of Salika (charming bird) is accepted in helping believer to achieve the best result of conversation and people kindness. Material: This See Phueng is made of beeswax boiled with banknote ash, Wanh Dork Thong, turmeric powder, etc. and the extra ingredients "old See Phueng AJ Plian", "Maha Wanh Indochina", "Tears Wax", "Dugong Tears Wax" and "City Pillar Nakhon Si Thammarat Province Wax 2530 B.E." to increase the power. Don't miss! Created only 2,560 pieces. Power: Wards off evil forces, inauspicious things and misfortune. Material: Buddha's grace powder called "Phong Phutthakhun"
Power: This Buddha amulet by AJ Plian holds powerful protection, so the worshiper will be safe from harm and dangers. Power: This Buddha amulet by Arjarn Plian has real excellent powers on menace protection and Metta; ability to gain people's mercy and favors. - Phong Maha Wahn Phra Arjarn Nam 2511-2513 B.E. - Phong Jatukam 2530 B.E. 1. broken powder amulets of Arjarn Chum Chaikiri 1941 - 1982 C.E. 2. Phutthakhunnimit Powder 1941 C.E. 10. multi-plant powder Indochina 1954 C.E. 12. Wahn Suriyan Jantra Powder 1987 C.E. Power: This Star Amulet will bring owner good luck in finance and business. Ceremony: This amulet was perfectly blessed by Arjarn Plian on 26 August 2017 (Sao 5). Power: Whoever owns this Flower Amulet will gain kindness from everybody and look attractive towards beholders. Power: Thing that people seeking for lucky amulet must see! Material: a variety of sacred metal such as death sentence prisoner's chain, old elephant hook, coffin nail, old bell, ancient bronze bangle, kris, Satang coins, rail knot, etc. Power: This style of hermit amulet is prominently powerful in charm especially to infatuate beholders or listeners that can facilitate love, negotiation or business. Power: This Takrut can shield owner from danger and injury. Ceremony: AJ Plian inscribed Yant script on Takrut sheet by himself. He performed the consecration on 19 April 2018 (Mater Day). Material: mixtures in this amulet majorly are holy powders such as herb powder making LP Thuad of Wat Sala Bang Poo, holy blessed powder LP Kloy Wat Pho Khao Thong, holy blessed powder LP Klam Wat Sala Bang Poo, etc. Information: In fact, belief about Buddha's Footprint appears in both Hinduism and Buddhism. In Buddhism, Sutantapidok Scripture says Buddha left his footprints at two places first by Nammatha River and second on Satjapantakiri Mountain. In India, evidence of Buddha's footprint was found around 3rd Buddhist century, the reign of King Asoka. Power: Having this amulet is like having Buddha with you everywhere. The talisman created in Buddha's footprint is believed to bring the best result in career, business, mercy and prosperity in any aspect. Power: This batch is great for finance, career and business. Inside power will protect and secure destiny of owner to easily complete anything, be more and more opulent and happy. 1) broken amulet powder of AJ Chum Chaikiri of year 2484-2525 B.E. 2) Phutthanimit (Buddha's premonition) Powder of year 2484 B.E. 10) Multi-herb powder Indochina era 2497 B.E. 12) Wahn Suriyan Chantra Powder 2530 B.E. Ceremony: This batch was consecrated on 27 September 2017 by AJ Plian and instructors of KowOor: Phra Mahacharoon Wat Khao Mueang, Phra Arjarn Chian Wat KowOor, and AJ Prathueang Innthong exclusively consecrated at his house on the same day. 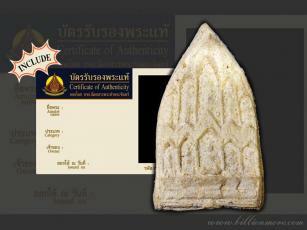 Objective: AJ Plian would like to donate money for developing and restoring Wat KowOor. Material: Elaborately created from 'Phong (powder) Wahn Fai Banlai Kan' or 'Phong Wahn Ya Maha Parb', the precious material for amulet from the past capable of exorcizing ghosts, devils, disturbing evils and bad omens. Moreover, mixed with multi-herb powder LP Nam 2511-2513 B.E. , 108 pollen powder, 108 Ga Fak (parasite plant) powder, multi-herb powder LP SriNgoen Wat Don Sala, Phong Bai Lan (talipot palm leaf powder) with ancient Khmer script, See Phueng Maha Larp (wealthy wax) AJ Plian, tears wax, dugong oil and Wahn Dork Thong. Ceremony: AJ Plian properly traditionally made after treatise of war strategy and wealth magic of KowOor and the use of holy Buddhist mantras. Power: The amulet carries off illness, distress, protects against ghosts, devils, and stops the occurrence of the inauspicious and bad omens. Holder will gain good luck, windfalls, fame, authority, safety and well-being. Information: Shiva, one of the main deities of Hinduism, whom Shaivites worship as the supreme god. Among his common epithets are God of Destruction, Shambhu ("Benign"), Shankara ("Beneficent"), Mahesha ("Great Lord"), and Mahadeva ("Great God"). His worship enables his worshiper great destruction against Menaces, Evil, Obstacles & Misfortune. Present: It was the great auspicious time that AJ Plian permitted to make his locket. For locket high power, AJ Plian filled the back of the locket with multi-herb mass LP Nam Wat Don Sala, Phong Phutthakhun (great blessed powder) LP Pan, Phong Wahn Phutthakhun (great blessed herb powder) LP SriNgoen, Phong Wahn Phutthakhun (great blessed herb powder) LP Kloy, Phong Wahn Ithijay & Pathamang (great blessed herb powders) LP Pan, KowOor's Ritual Black Sticky Rice Powder and many kinds of herb collected for a long time. Ceremony: LP Plian performed blessing this locket properly following traditional method of KowOor on the auspicious day. Power: AJ Plian locket is strongly capable of harm protection, enhancing worshiper's fortune, people kindness and fulfilling merit-based determinations. *Vow Chula is a name of Thai kite. This medal is in this shape, so it is called 'Pim Vow Chula'. Ceremony: AJ Plian blessed this batch on 12 Apr.2018 in front of Wat Don Sala, Phatthalung Province. "Phaya Yom Matjurat (shortly 'Phaya Yom') is the heaven deity whose duty is to see humans' destiny; which person reach time to die or not? He will record our good deeds and bad deeds in his book. So, no one is out of his sight." Power: Whoever worships Phaya Yom will have long life without illness, bad luck and disturbance from evil and demons. Wearing helps protect from dirty magic and the ghosts cannot do us anything because they very much fear Phaya Yom. Made not over 500 pieces. Power: Tao Wet Su Wan is one of the 4 guardian angels governing the northern zone of human world. He is the ruler of all giant beings and whom ghosts and lower spirits fear. In Thailand, you can see the statues of Tao Wet Su Wan in many Buddhist temples. Old people say Tao Wet Su Wan can grant safety from bad spirits and black magic. Moreover, Tao Wet Su Wan is the god of wealth due to his name of "gold". Whoever worships Tao Wet Su Wan will be granted piles of fortune. Made not over 1,000 pieces. Strong Help of Great Hermit! 9-Metal Paddle-shaped Lersi Narod Medal- Wai Kru' batch 2561 B.E. Created for only 85 pieces. Lersi Narod performed perseverance at the Solot Mountain out of LongKa City. On the way Hanuman was carrying a ring to Nang Sida, he flew over LongKa and met Lersi Narod. They both battled the magic and Hanuman eventually lost to the Hermit. That made Hanuman so reverential and obedient with Lersi Narod that he asked the Hermit to put out the fire at his tail when he burnt LongKa. Experts say Lersi Narod is the first hermit of Traiphum (three realms: world, heaven and hell). Any ritual without invitation to Lersi Narod is assumed not perfectly done. Power: Believing Lersi Narod can bestow his devotees the great luck, success and prosperity. Moreover, he can protect against dangers, spirits and all invisible threats. Strong Help of Great Hermit! Lead* Paddle-shaped Lersi Narod Medal- Wai Kru' batch 2561 B.E. Strong Help of Great Hermit! Ancient Bronze Paddle-shaped Lersi Narod Medal- Wai Kru' batch 2561 B.E. Strong Help of Great Hermit! 9-Metal Paddle-shaped Lersi Narod Medal– Wai Kru’ batch 2561 B.E. Strong Help of Great Hermit! Lead* Paddle-shaped Lersi Narod Medal– Wai Kru’ batch 2561 B.E. Strong Help of Great Hermit! Ancient Bronze Paddle-shaped Lersi Narod Medal– Wai Kru’ batch 2561 B.E.